During the 2007-08 Antarctic field season, the UNAVCO polar group supported 19 individual PI-based science campaign projects. Seventy receivers were sent to the continent for campaign support, including twenty NetRS receivers. Ten of these GPS receivers remain on the ice to support long term data collection at WAIS divide as Slawek Tulaczyc (I-345M) expands his monitoring of the Willans Ice Stream on the West Antarctic Ice Sheet. Other supported investigations included rigorous tidal motion monitoring for the Antartica Drilling (ANDRILL) project (Harwood), deformation studies of Mt. Erebus (Kyle), observing ice stream outlet dynamics in the Kamb/Whillans ice stream region (Catania), characterization of glacial and basal flow dynamics of the Thwates Glacier (Gogineni, Anandakrishnan), precise navigation control for a state of the art ROV (Kim), geo-referencing for the International Trans Antarctic Expedition (ITASE) and support of the Dry Valleys Long Term Ecological Research projects (Doran, Ross, Fountain). Maintenance and site upgrades were made to the CONZ installation, improving the power capabilities and updating the hardware configuration to be more in line with UNAVCO autonomous GPS stations. The Base monument at Lake Hoare was moved to the side of one of the more permanent structures in the Lake Hoare camp. Rising lake levels were quickly inundating the old BOB1 monument frequently used by the LTER groups within the Taylor Valley. Data retrieval from Cape Roberts and Mt. Fleming continues through the Truncated Cones repeater site on Mt. Erebus. Data are downloaded daily and delivered directly to the UNAVCO data archive. The telemetered data is collected by receivers at the NASA building 71 in McMurdo. This system was improved significantly with the antennas moved to much better locations on external towers, and cable routing into the building now coming through bulkhead connectors rather than a hole in the side of the building. The MCM4 antenna cable was rerouted as to clear it from the locked area of the building. Additionally, the old MCMC Ashtech receiver was replaced with a NetRS receiver. A new ground based LIDAR system was purchased, greatly expanding the offerings of the Polar division in the Antarctic and the Arctic. 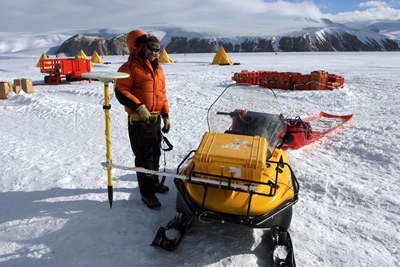 The system was brought to Antarctica for field trials, with solid results. Interest in this new capability is already gaining steam within the grantee community. Figure 1 - UNAVCO Engineer Thomas Nylen prepares to survey a 20 km seismic shot line laid out by the ANDRILL crew at Granite Harbor. 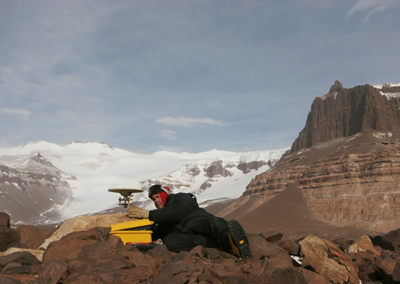 Figure 2 - UNAVCO Engineer Joe Pettit sets up a GPS receiver to update the movement of boulders covering the Beacon Valley glacier. 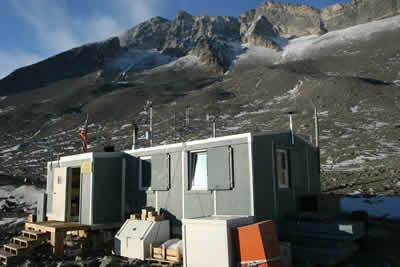 Figure 3 - The local base at Lake Hoare in the Taylor Valley was moved to one of the more permanent structures at the Lake Hoare camp to better serve the LTER community. 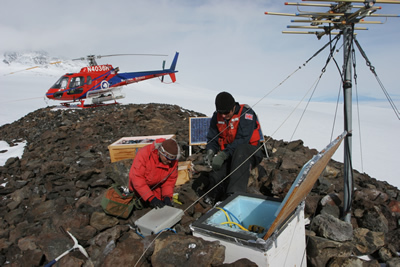 Figure 4 - UNAVCO Engineer Thomas Nylen and pilot Paul Murphy inspect the permanent station at Abbott Peak, on Mount Erebus.